Stenny could not get past Montrose shotstopper Allan Fleming, seen here in previous action. But the Warriors had much of the second-half pressure on Saturday at Links Park and probably deserved a point against Montrose. However they shot a giant hole in their foot with just a minute or so to go when a mistake from a passback let the hosts in for their second goal of the day. The Ochilview side had made numerous advances after the interval but the ball would just not bounce kindly for them, as Montrose held on to a probably deserved but not overly convincing single-goal lead. Manager Colin McMenamin declared himself “very disappointed” with the day’s endeavours. 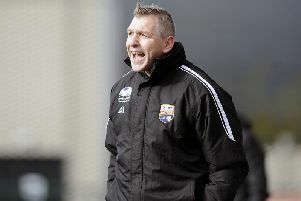 While he reckoned Stenny deserved somethiing from the game, he said the quality in the final third had not been good enough and they had not been ruthless enough to trouble Montrose. In the first half, he added, Stenny were slow and lacked intensity, which was very frustrating. Andy Munro cleared a sixth-minute effort by Euan Henderson off the line, while Alan Reid fired over from a good position after a useful-looking cross fromk Ruaridh Donaldson, before Montrose went ahead in the 12th minute. The ball was played to Terry Masson in the box, who was under pressure but neatly created more space for himself to fire a left-foot shot past Graeme Smith. Stenny were forced into defence for a while afterwards but almost grabbed an equaliser on 37 minutes, hinting that one goal probably would not be enough for Montrose. A free kick just outside the box by Conor Duthie took a deflection on its rising trajectory towards goal and was tipped over excellently by man of the match Allan Fleming. There was still time for another goal-line clearance, again by Stenny’s Munro, before the half-time whistle. Stenny were presented with a good chance to level on 49 minutes, as Duthie passed to Mark McGuigan on the right flank. His cross was poorly cleared but Russell Dingwall shot wide. 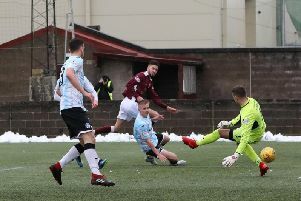 Fleming held a shot from outside the area by Duthie, while a superbly timed tackle at the other end from Sean Dickson halted a dangerous advance into the box by Andrew Steeves. Stenny were also defending more robustly by this stage but still kept up the pressure on the home goal. Dingwall made a superb run into the box for Stenny after 67 mins but McGuigan, practically on the goal line, couldn’t reach his cross. It had been a largely frustrating afternoon for the visitors but a goal would not have been undeserved with their last few throws of the dice. However, in the dying stages, Stenny were short with a pass back to Smith, who came out and did very well to block from the charging Lewis Milne. But sub Martin Rennie collected the loose ball and had a relatively simple task of netting the concluding strike. Montrose - Fleming, Steeves, Bolochoweckyj, I. Campbell, Dillon, Watson (Cregg 79), Redman, Masson, Henderson (Rennie 70), R. Campbell , Antoniazzi (Milne 70). Subs (not used) - Callaghan, Harrington, Webster, Matthews. Stenhousemuir - Smith, Reid, Donaldson, Marsh, McGuigan, Duthie, Dickson, Munro, Dingwall (Gibbons 90), McBrearty, Hurst. Subs (not used) - Neill, Ferry, Halleran, Watters, McMinn.